You may have heard a little bit about the new Pittsburgh Brewers Guild that's been formed here. It's something that's been a long time coming, and we couldn't be happier. This is a great way for us to advocate for ourselves and our community and do what breweries do best: work together to make great beer. Cheers to all the board members who have contributed their time and energy to making this happen! Now to the fun stuff - all the local Pittsburgh breweries are teaming up with each other to make some special TOP SECRET beers, and ours is a collaboration with Aurochs and Cinderlands. And you'll be able to taste that beer at the PITTSBURGH BREWERY GUIDE release on Friday, August 24 at Nova Place! Tickets available here. Come get some collaboration beers you can't get anywhere else, plus a look at the new Brewery Guide and website. Putting together a comprehensive guide to all the local breweries is a great idea and everyone at the Guild and the marketing team did a fantastic job - this thing is bee-yoot-iful. Even better is the website, which shows all the local breweries & taprooms but also lets you sort by filters such as who's open now, food trucks, dog friendly, etc. No one in the country has a brewery tourism site this awesome, and we can't wait for you to see it. And finally, as part of the Guide release weekend, we'll be offering a FREE look inside our brewery in Larimer on Saturday, August 25 from 1-4pm! Just stop in and our resident tour guide/brewer Anderson will be happy to show you around and answer some questions. 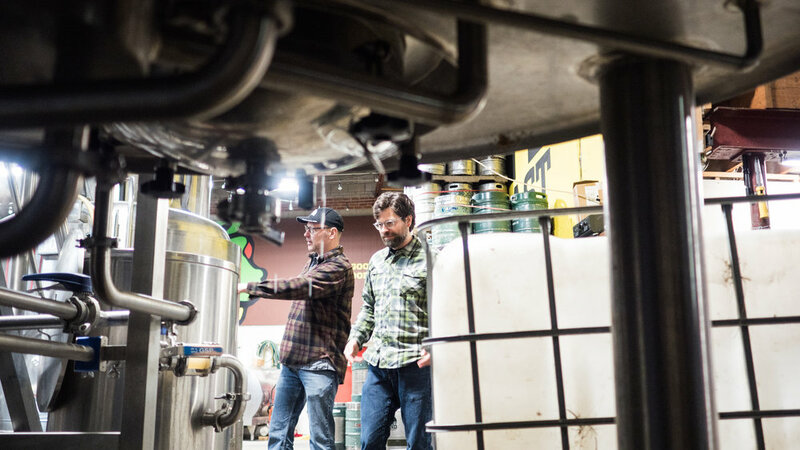 Get a quick look around our brewing operations and snap a couple pics for your instagrams. You'll probably also get a brief run down of the history of East End Brewing and what we focus on as beer makers. Click here to get a free ticket for everyone in your group so we have some idea of how many people to expect that day (Oh and we should mention that while kids are welcome at the Brewpub, our Brewery Tours are just for folks 21 and over). So get those tickets, get ready for some great collaboration beers, and a great new brewery guide! Sunday, July 22nd from 12-5pm, join us at the Larimer Brewpub for a SUMMER edition of Crafts and Drafts! We'll have some great artists, crafters, and makers selling their wares outside, along with free samples of beer, food from La Palapa, Traditional Mexican Kitchen, and Millie's Homemade Ice Cream truck on site. Drink, eat, and shop local this summer! Click here to see the full list of vendors. Plus our head brewer Brendan will be on site pouring and talking beer, along with raising money for his annual bike ride to fight MS. Chance A'Shahrs 5.8% Our juicy New England style Pale Ale is tasting great; citrusy and floral with very little bitterness on the back end. Get it on draft or in cans with limited quantities left at both locations. Wheat Hop 4.9% Our original haze brew with low hop bitterness and high hop flavor and aroma. On draft at both the Brewpub and Taproom. Last kegs so get it before it's gone! Green Giant Citra IPA 7.2% It just doesn't feel like summer until Green Giant is on tap. Debuting on draft July 14th and soon afterwards in cans, our West Coast style IPA is a single hop brewed with Citra Hops... first wort and late addition hopping keep the bitterness down and the hop flavor up front where it belongs. Join us! "For the Culture" A special BRUT IPA collaboration for BLACK BREW CULTURE As part of Fresh Fest happening on August 11, we're proud to be working with Mike Potter from Black Brew Culture to brew a new Brut IPA to debut at the Festival and in cans soon afterward; Stay tuned and get your tickets for Fresh Fest now! Watch for a blog post about what a Brut IPA is, and why we think Black Brew Culture is such an important part of our Craft Beer World. Don't know anything about Craft Beer? Start THIS SATURDAY July 7 at 1pm. Come get a quick look around our brewing operations, snap a couple pics for Instagram, and have a few beers. 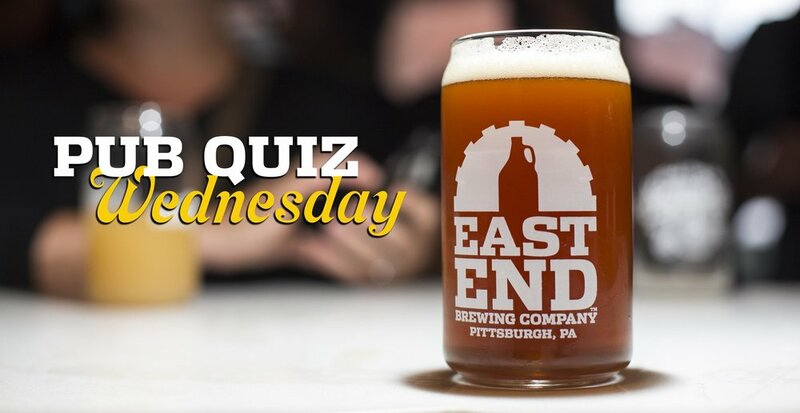 You'll get a brief run down of the history of East End Brewing, what we focus on as beer makers, and then we'll turn you loose in the Brewpub with a voucher good for a flight of 3 samples of your choosing. Perfect for the Craft Beer ROOKIE who knows a bit about beer, and wants to enjoy a flight in the bar. We love Bikes here at East End (have you had some Pedal Pale Ale yet this summer? ), so we were thrilled to see that the next Open Streets runs right along Frankstown, literally our back door! We'll be set up outside offering water, some tents for shade, and maybe even a few beers if you want to swing in and enjoy a GOOD BEER on a good bike... or any bike really. Or skates. Or if you're just walking. Stop by and see us July 28th! We're still working on our new restaurant project with Justin Severino to get it open just as fast as we can, but in the meantime we've got food trucks and mobile vendors to feed you! Here's our current list for July and you can always check out the COME HUNGRYpage on our website. And of course, you can always BYOFood to either of our locations any time you like! Have you stopped by the Brewpub for Quiz night with Buzzworthy Trivia? It happens every Wednesday starting at 7pm, it's free, you can win great prizes, oh and there's BEER too. What are you waiting for? See you Wednesday. BREWERY 101, Introductory beer tour at the Brewpub starting at 1pm. More info & tickets here. GREEN GIANT DRAFT RELEASE, starting 10am at the Taproom in the Strip, 12pm at the Brewpub in Larimer. GRAINS TO GLASS BREWERY TOUR, A more detailed look at how the Brewery works at the Brewpub starting at 1pm. More info & tickets here. Both locations are closed on Wednesday, July 4. Stock up on beers beforehand and enjoy the holiday! The Beers of Summer are Here! Sun’s out, beer’s out…in cans, that is! We’re releasing three of our best summer brews in cans on Thursday, June 14th, along with four returning favorites, all freshly canned. Cans go on sale at 11am at the Taproom in the Strip and 4pm at the Brewpub in Larimer. Pro tip: We always keep more cans in stock at the Brewpub than at the Taproom in the Strip, mostly due to space concerns. And if there’s a line, 1 case limit per each beer; No line? No limit! And as a reminder, Big Hop, Monkey Boy, Fat Gary, and Pedal Pale Ale are all shipping to our wholesaler now. What does that mean for you? Well, if you'd like to buy these beers at your local beer distributor, grocery store, or even gas station, just ask them to contact their rep and get some FRESH LOCAL BEER! Blood Orange Big Hop on Nitro 5.8% You know Big Hop. You love Big Hop. But have you had it infused with blood orange and delivered smooth and silky on Nitro? Because you probably should. Brett Hop 5.9% Our mad scientist version of Big Hop, open-fermented with Brettanomyces instead of our house ale yeast, and then mellowed in red wine barrels for 2 full years. It's hoppy, funky, and wonderful, and on draft at the Brewpub in Larimer for a limited time! As you may know, our Pedal Pale Ale Keg Ride isn't just one of the most fun events of the year, it's also a charity fundraiser. Each year we work with a different local charity, and this year it was the Pennsylvania Chapter of Gift of Adoption. So click here to check out the blog post about why we picked this charity and how much we raised: spoiler, it was a lot and we're really grateful to everyone who helped out. Yes, even Mr. Sunshine! Do you have a special interest in beers that have spent time in bourbon or wine barrels? 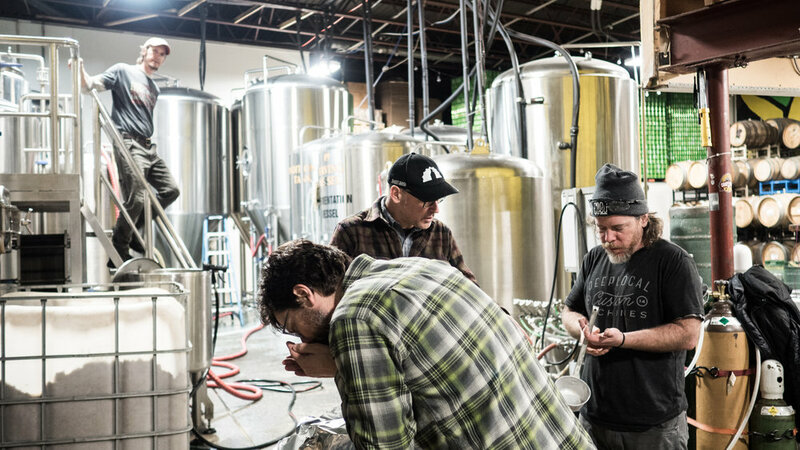 Want to learn about "sours" and beers that undergo more unusual fermentation methods? Are you a fan of the kinds of beers poured at our GOOD WOOD festival each Winter? This tour on Saturday, June 9th at 1pm is a barrel room tasting-focused run through four beers from our barrel-aging program, with a discussion about the processes used to make each. This $20 tour is best for SEASONED BEER FANS interested in learning about our barrel-aging programs and some of the more unique beers styles we brew. The tour and tasting will last about forty-five minutes... but you're always welcome to linger in our Brewpub afterwards. Click here for tickets! Astronomy on Tap RETURNS on Thursday, June 7th at 7pm at the Larimer Brewpub! There will be fun, informal, and accessible talks about astronomy by some friendly local astronomers! We will also have games, prizes, and of course, beer! RSVP and get more info here. On Friday, June 8th our beer will be at the Cotton Bureau Bazaar-Beque party starting at 4pm, with shopping, food, and music! They're our neighbors in Larimer (just down the street) and they'll even be handing out coupons for a free taster of beer if you contribute to their raffle to benefit the Humane Animal Rescue League. We've got a bunch of other great events throughout June. Stop by either location, we've always got something going on. 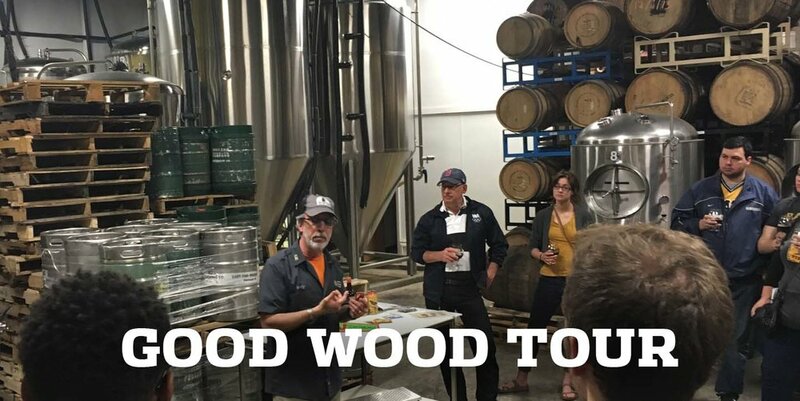 GOOD WOOD TOUR, At the Brewpub starting at 1pm. More info & tickets here. THE BEERS OF SUMMER CAN RELEASE, 11am at the Taproom in the Strip, 4pm at the Brewpub. More info here. 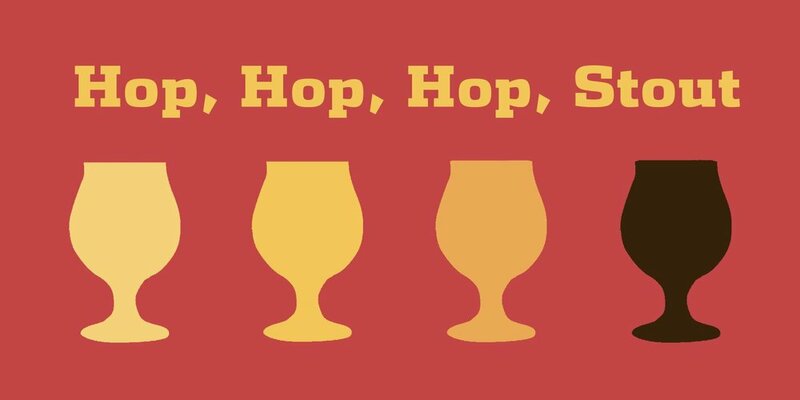 POETRY & PINTS, moves to the Taproom in the Strip, from 6-8pm. GRAINS TO GLASS BREWERY TOUR, At the Brewpub starting at 1pm. More info & tickets here. For the last 14 years, every Spring we put on one of our favorite events, the Pedal Pale Ale Keg Ride. Not only is it a great chance to get out on your bike for bit, but it's a chance to get some of the very first of this year's Pedal Pale Ale... the beer that ALWAYS tastes better after a bike ride, and even better still when the kegs have been hauled by bicycle! The Keg Ride is also a big charity fundraiser for us, with the proceeds going to a different local charity each year. This past April, we were thrilled to raise money for the Pennsylvania Chapter of Gift of Adoption, a group whose work is near and dear to me personally, and to my family - along with thousands of other people throughout our region. This whole thing started as a fun and kind of silly way to spread the importance of drinking locally, and thanks to your help, over the years has become a great way to give back to our community. We want to thank everyone who helped us put this event on, including our terrific staff, Flock of Cycles (our ride marshals), Bike Pittsburgh (for the bike racks and generally being AWESOME), Gift of Adoption, everyone over at Rock Bottom Brewery in Homestead (our secret destination), and most importantly, all of you riders who joined us to have fun & help out a great cause. YOU ALL ROCK! And we're already looking forward to 2019. But I'm sure we'll see you again before the 2019 Keg Ride comes back around. 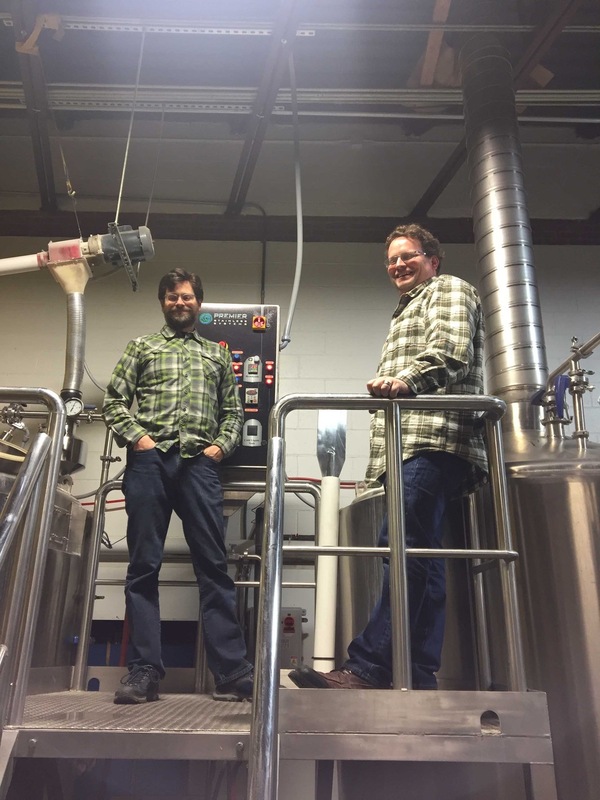 Chris and John Trogner have been making great beer - excuse me... great PENNSYLVANIA beer for an awfully long time. At least 22 years seems like a long time to me. Especially if you measure it in Craft Beer Years, which are longer than dog years I think. After a few rounds of emails, a couple conference calls, and some group text messages about WHERE we'd brew, WHAT we'd brew, and HOW we'd brew it, we settled on a plan: We'd brew it here at East End. We'd brew a low-bitterness, hop-forward IPA, with loads of late addition Comet, Azacca, and Simcoe hops, and it would be dry-hopped with more of the same. And that we'd brew it with as much Pennsylvania malt as we can get our hands on, on short notice... which all ended up being in Central PA.
After a few phone calls with Deer Creek Malthouse and Double Eagle Malt, we secured about 2,000 lbs of Pennsylvania's finest malt, which John and Chris stuffed into their Suburban, along with a few hundred pounds of hops... and enough Tröegs Beer to get us through most of the brew day. Luckily, when they got to meet Pennsylvania's Turnpike's Finest (hauling a ton of malt down a mountain can apparently make you roll in excess of the posted limit), they didn't get asked about the sacks of suspicious looking cargo. So the fine was just for speeding. Then much MUCH later, after a long double brew day, lots of shared beers, some dinner, more beers, and possibly a Tiki Cocktail or two, we settled on the name "BORN AND RAISED - Pennsylvania IPA". You'll be able to find BORN AND RAISED Pennsylvania IPA on tap at "better beer establishments" all around town during Pittsburgh Craft Beer Week. You can also get a glass or some 16oz cans of BORN AND RAISED at both EastEndBrewing locations when we release it on April 12th... and if you come to our Julius St./Brewery location, you'll also get to enjoy a Tröegs tasting and guest tap, while the folks from Tröegs tell you all about everything beer-related going on in their Hershey, PA home. And speaking of Hershey... you Central PA GOOD BEER Fans will soon find a bit of BORN AND RAISED showing up at the Tröegs Brewery Tasting Room... though, I'd say it's more like an airplane hangar filled with happiness than just a "room". I'm not sure when it'll land or when it'll go on tap, but I'm sure you can pester them about it on social media or something like that. GRATITUDE RELEASE DAY MARCH 24th! Barleywine is a beast of a beer style, there's no debating that. And it's always held a special place in our hearts and in our glasses here at East End Brewing. Unique in its composition and presentation, and in its ability to gain complexity and improve with age, barleywine is also really tasty. We've been brewing our Gratitude Barleywine with the exact same recipe since our very first year, as an annual thanks to you, our GOOD BEER Fans, for supporting us throughout the year. A limited run of Gratitude in our original packaging, with brand new artwork on hand silk screened over wrap labels, hand waxed, signed, numbered, and suitable for framing. Okay, maybe you can't frame a bottle. But this is BY FAR the most ridiculous and beautiful package we've ever put our beer into. And while it's a massive amount of extra work, it's something too cool to not bring back on a smaller scale every once in a while. And this is the year! Vintage Gratitude bottles from the last couple years. Vintage Gratitude Flights with all sorts of gems from our deep-deep cellars. THE Gratitude Label Artist, and all around bird maven, Mary Tremonte will be here with a pop-up store. Prohibition Pastries will be feeding us all day at the Brewery. *This year, we're opening up a bit early, because as barleywine fans already know, March 24 also the date of Kelly's infamous Hell With the Lid Off Barleywine festival, so plan your day accordingly, and responsibly. Some of you may know that even before we moved into our current home back in 2012, Commonplace Coffee has been roasting coffee beans in our building. It's been a wonderful partnership over the years, mutually beneficial on so many fronts. Not only does it fill the building with even more wonderful aromas, but we've been able to use their coffees in our Eye Opener Coffee Porter, JoeMelt, & Vanilla Latte Cream Ale - not to mention keeping a steady stream of cold brewed coffee on our nitro tap. So it's with mixed emotions that I tell you that last month, Commonplace has moved on to bigger things, quite literally. They're now doing all of their roasting in a great big warehouse right down the road. 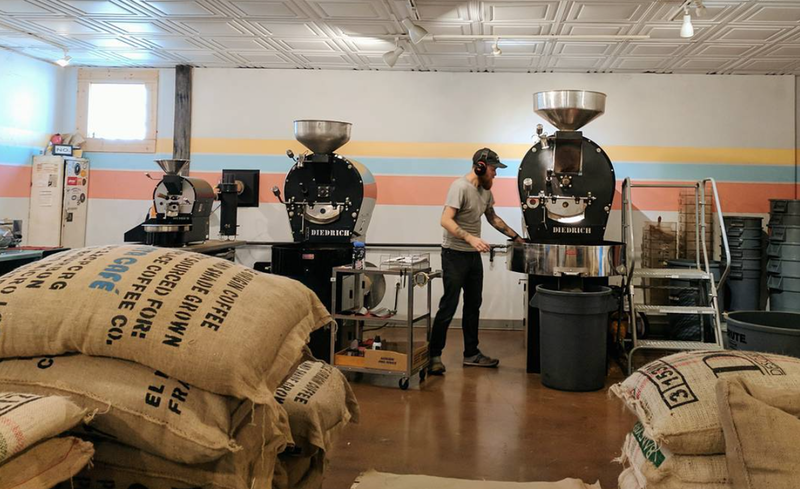 And while we're sad to see them go, we couldn't be happier for what's ahead, or be more proud of what they've brought to Pittsburgh's coffee scene in just a few short years. And don't worry. That nitro cold brew we have on tap isn't going anywhere. GOOD FRIENDS and a good brew go together like, well, coffee and beer. Congrats to everyone at Commonplace! Earlier this week, we released a whole bunch of hop-forward beers in cans and on draft. As of this writing, there's still some of everything left here, so come grab some for the beer fridge. CAUTION SLIPPY NE DIPA 8.2% A big, dank New England Style Double IPA with Eureka and Experimental 06297 hops. 16oz cans and draft. PARTLY CLAHDY 6.0% With some nice updates from our first release of this beer, this New England style IPA focuses more on flavor and dry hop additions than on bitterness, with El Dorado and Idaho 7 hops. 16oz cans and draft. BIGGERHOP 9.5% A new batch of our classic West Coast Double IPA with Simcoe & Amarillo hops. Best enjoyed FRESH. 16oz cans and draft. PREMIERE SAISON 7.3% Spring calls for farmhouse ales and our Belgian-style Premiere Saison answers that call with a light, crisp, dry-finishing ale. STEEL CUT O'ATMEAL STOUT 4.4% Punctuation liberties aside, our hearty Oatmeal Stout will be back on draft this month, lower in alcohol and perfect for a nice long session on St. Patrick's Day. MASHUGANA STOUT 14%??? Later this month (we aren't exactly sure when), we'll be releasing a great big bunch of "nonsense" that we put together for you. It's a strong stout beer brewed with a couple hundred pounds of belgian dark chocolate, loads of actual marshmallows, and then dry-crackered with crushed graham crackers. We think it's pretty delicious, but it'll take a bit more time before it's finished up. And while I know this is the "DRAFT ONLY" section, we're going to see about getting some Mashugana into cans for you too. Campfires at the ready... stay tuned! Sunday, Sunday, Sunday March 4! Sweet Horror is back at the Brewpub; It’s a pop-up featuring vegan treats and horror/pop-culture inspired art (think zombies, aliens, and the whole realm of horror pop-culture) And the event is free and family friendly! Get a beer for yourself and a housemade root beer or ginger ale for the kids. It's the best vegan treats in Pittsburgh, under one roof with some great artists. See you Sunday! Ride a bike, have a beer, raise some money for charity! Tell EVERYONE YOU KNOW, okay? This Saturday, March 3 we're excited to be selling beer at the screening of the new Betty Davis documentary "They Say In Different" at PGH Filmmakers Regent Square theater. Come for the screening and live performance by Davis's band Funk House, and get a can of FRESH LOCAL BEER to enjoy during the show. We'll be donating a portion of our proceeds back to PGH filmmakers. Tickets on sale now! SWEET HOROR 4.0, 1-4pm Vegan treats and horror-inspired artwork at the Brewpub. PUB QUIZ with Buzzworthy Pub Trivia at the Brewpub 7pm. Free! POETRY & PINTS, 6-8pm Bring poetry to read, or just listen! At the Brewpub. Free! BEER BELLY YOGA with the amazing instructors from I Am Yoga Squirrel Hill. 10am-noon, tickets available here and hurry, the January yoga sold out! Come get your Barleywine at the Brewpub! GRAINS-TO-GLASS BREWERY TOUR 1-2pm at the Brewpub. More info & tickets here. WHAT'S THIS ABOUT A RESTAURANT AT THE BREWERY? It's true! We're working with Justin Severino & Hilary Prescott Severino (of Cure & Morcilla) on a new casual restaurant concept here at East End Brewing in Larimer. We couldn't be more thrilled; the Severinos have not only been pouring our beer for years at their restaurants and at their events, but we also consider them GOOD FRIENDS. 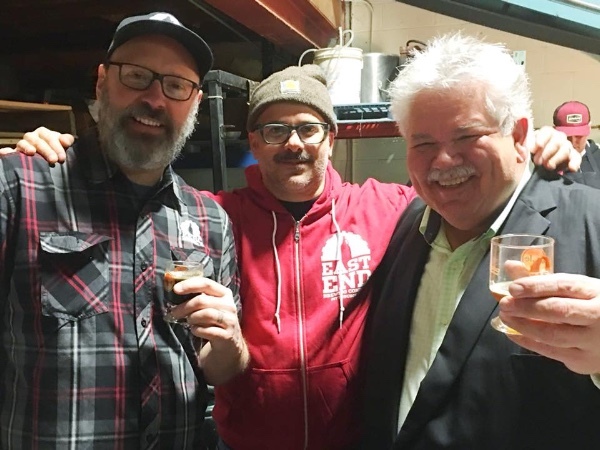 The folks who attended our Good Wood Festival last month got a sneak preview of the type of casual but delicious food they're hoping to serve... and the King of Pittsburgh himself, Rick Sebak, blessed this union with some barrel-aged beer. So now it's a done deal. WHEN DOES IT OPEN? I'M HUNGRY NOW! Tuesday. No, not THIS Tuesday, but we think it'll be on a Tuesday. The honest answer: as soon as humanly possible. If you've been to the Brewpub lately, you've probably noticed the construction on the back side of the room, as well as the ongoing bathroom renovations. As anyone who's done construction knows, it's a start and go process, but we're pleased with how quickly it's going so far. We'll also be improving our outdoor patio in time for Spring... can you say COOKOUTS? So thanks for your patience while we continue to build some more awesomeness here! Sadly this does mean that we'll have to say goodbye to many of our favorite food truck partners, although we're hoping to do some special events with them before the restaurant opens. We're deeply indebted and grateful to our food truck friends for feeding us all these years. So stay tuned for some stuff with them, before we bid adieu. THIS ALL SOUNDS GOOD, BUT SERIOUSLY... WHEN IS IT OPENING? More info to come on these, so watch the social medias for the latest details as the date nears. BIGGER HOP DIPA 9.5% Cans are almost gone, but we've still got draft, and a round of FRESH CANS are on the way! PA HANDSHAKE 7% Cans are sold out and this beer is almost gone on draft! Come fill your Pints, Growlers, Crowlers, and your mouth while you can. FASTER THAN THE BEAR 8.2% A new Baltic Porter that drinks sweet but finished dry. Lagered for 6 weeks, dark, potent, and the perfect companion for these cold winter evenings. BRETT HOP 5.9% What if we took your old standby BigHop, and instead of fermenting it with our house ale yeast, did something completely different with it... like ferment it on a pitch of brettanomyces in a semi-open fermenter. And what if after fermentation slowed down, we took that beer and transferred it to a bunch of red wine barrels and then aged it there for over two years? Seriously.. TWO YEARS! Well...we did all of that, and now it's on tap. VANILLA LATTE CREAM ALE 5.9% Your favorite Cream Ale recipe - which btw, uses Pennsylvania's own Double Eagle Malt, grains sourced from Farmers right here in Pennsylvania! Well, we've infused it with both Commonplace Coffee's Papua New Guinea roast and some all natural Mexican Vanilla for a wonderfully unique, coffee-cake like flavor. You've seriously got to get in here and taste this. It's like... well, nothing else really. LORD NORDSBERRY 6.1% A chocolatey, malt-forward, Belgian Ale brewed with a whole bunch of raspberries. Valentines Day falls on the 14th this year... just sayin'. We're also getting ready to say goodbye to SnowMelt Winter Ale, Farkleberry Pale Ale, and Bonsai Small Beer, so get your affairs in order people! GRATITUDE RELEASE DAY IS COMING! Gratitude Barleywine in waxed 22oz bottles, LIMITED EDITION Gratitude Barleywine in throwback paper overwrap waxed 750ml bottles, Barrel Aged Gratitude in 16oz cans... Plus on tap: vintage Gratitude and BA Gratitude flights, some awesome eats, and, well, all the usual stuff we bust out for this most special day of the year. We're working on the date, and we've got a LOT to finish up before then, so give us a sec and you'll be the first to know! Beer at the John Carpenter Festival! John Carpenter? More like John CANpenter this Saturday, February 10 when we're selling beer at the John Carpenter Film Festival at the Hollywood Theater in Dormont. We'll have a selection of FRESH LOCAL BEER in 12 and 16 oz cans to heighten your viewings of Dark Star (2pm), The Thing (4pm), They Live (7pm) and Prince of Darkness (9pm). Buy from us in the lobby and take it into the theater! See you Saturday. And hey, if you're interested in having us sell beer at one of your events, let us know at events@eastendbrewing.com - we'd love to share the gospel of GOOD BEER. Mark Brewer isn't just a great guy with a lot of beer of knowledge; he's also a great artist and author of the book Brewology: An Illustrated Dictonary for Beer Lovers. We've asked Mark to bring some of his imaginative, informative, and funny drawings to the Taproom for an exhibition starting on Wednesday, February 21. Come see Mark's work from 5-8pm, get a beer and maybe buy a book too! The exhibit will run through the beginning of April. We're proud to be a CSA pickup location for our friends at Penn's Corner Farm Alliance. That's what those folks strolling through our Brewpub to pick up a box from the cooler are doing when they show up! Sign up now for the regular farm CSA, or the Cheese Share, Egg Share, Flower Share and more! Register at PennsCorner.com by 2/24 to get a 3% early bird discount, get some great produce, and a reason to visit us every week! 2018 Keg Ride Planning is Underway! That's right, the 2018 Pedal Pale Ale Keg Ride is happening on April 21. 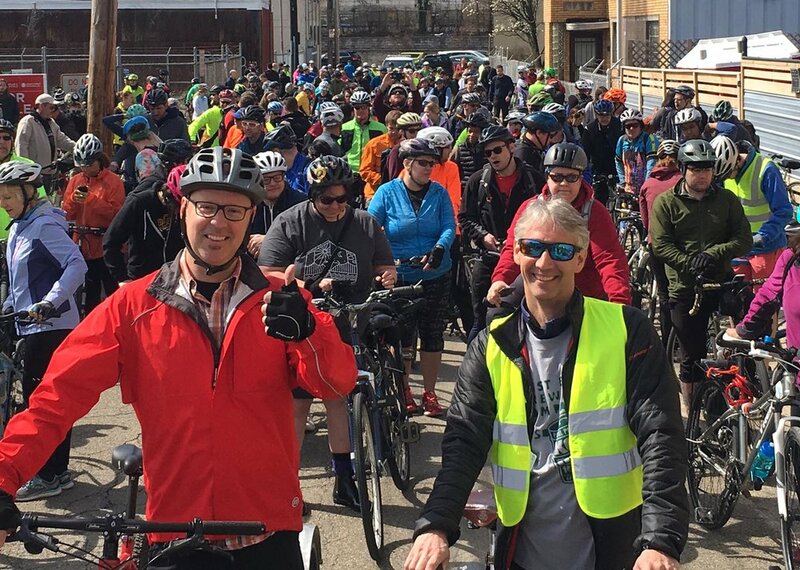 We'll have registration and more information soon, so you can join us in using PEDAL POWER to move legs of beer through the streets of Pittsburgh. PUB QUIZ with Buzzworthy Pub Trivia at the Brewpub 7pm, and food from Tango Food Truck. Free! POETRY & PINTS, 6-8pm Returns on Thursday, February 8 from 6-8pm! We'll have a host and poetry books available if you have a passion to read. BEER at the JOHN CARPENTER FILM FESTIVAL at the Hollywood Theater in Dormont. Hop, Hop, Hop, Stout simultaneous can release at both locations. More info coming soon! Just a note that we'll be closing at 5pm at the Brewpub on Saturday, January 20; normal hours at the Taproom in the Strip. We're closing up shop early for the SOLD-OUT Good Wood Festival of Barrel-Aged Beers. If you got your ticket, we're looking forward to seeing you! If you didn't, keep an eye on our draft list after this event, as we'll often throw on something interesting from the event. Thanks! Our barrel-aged beer festival is back for the Fourth year! Pittsburgh area breweries will be sharing their best barrel-aged brews alongside a tasting of Wigle spirits. The full price ticket gets you a snifter glass for beer sampling (and to take home), barrel-aged beer sampling, Wigle spirit sampling, and you can purchase food from Justin Severino of Cure & Morcilla restaurants. Plus there's designated driver tickets available too. Get your tickets now before this one sells out...as it has each year. On Wednesday, January 17th we'll be releasing four of our most requested beers in 16 oz cans, along with FRESH six packs of Big Hop. 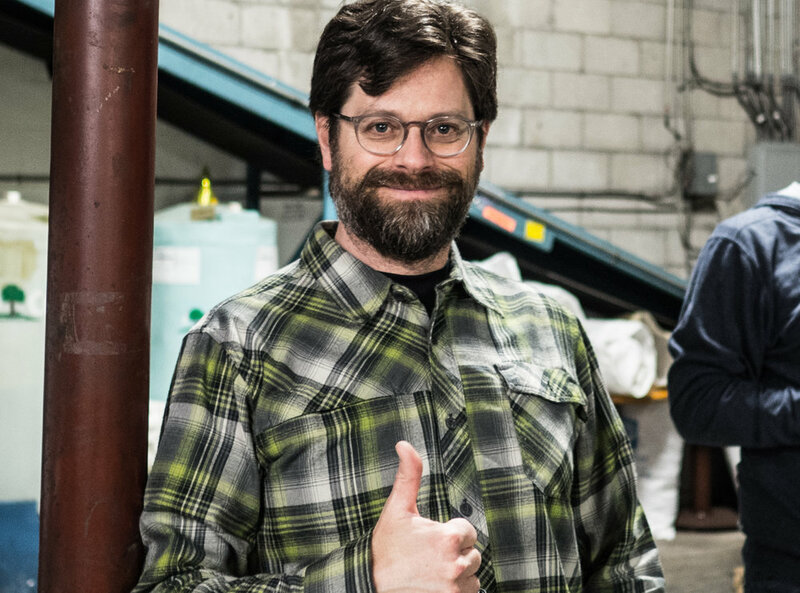 The beers include: PENNSYLVANIA HANDSHAKE (our Milkshake IPA collaboration with Pizza Boy Brewing), BLACK HOP(a Cascadian Dark ale, aka "Black IPA"), BIGGER HOP (Big Hop's Double IPA cousin), and BBA FATTER GARY (A bourbon barrel-aged Imperial Brown Ale). This is the first time in cans for Black Hop & BBA Fatter Gary, plus a highly anticipated return for PA Handshake and Bigger Hop DIPA. Cans go on sale WEDNESDAY, JANUARY 17th at 11am at the Taproom in the Strip and 4pm at the Brewpub in Larimer. If there's a line, 1 case limit for each beer. No line, no limit. All beers available on draft on Wednesday for tasters and pints; no Growler or Crowler fills of Handshake, Bigger Hop, or Fatter Gary until the cans are sold out. LORD NORDSBERRY BELGIAN ALE 6.1% A rich, bold, reddish brown Belgian ale, lightly hopped and malty with dark chocolate notes, and a bright raspberry finish... probably because of the raspberries we added to the kettle, and in late fermentation. LITTLE HOP 4.4% Our session IPA is dry-hopped with a new hop variety on every single batch. This fresh batch is brewed with Huell Melon hops. Try this new batch for a fruity, hoppy flavor and extended drinking session. Coming soon: GRATITUDE BARLEYWINE and BOURBON BARREL-AGED GRATITUDE, with a special limited-run treat for those pining for the original Gratitude packaging. Look for these beauties to drop sometime soon, probably March. We are teaming up with one of our favorite food vendors to ring in the New Year right with a 3 course beer dinner, January 7th from 6-8pm at the Brewpub. $30 gets you a 3 course meal each paired with a pint of East End Beer. Click the link to see the full menu & buy tickets. Pork & Beans downtown is kicking off their first MEAT YOUR MAKER with us! Come drink beers with beer reps & brewmasters on FRIDAY January 12th from 5-7 PM. It's a 5 course HUNGARIAN FEAST with our pals over at The Vandal, complete with matching East End pours for just $60 per person. Call (412) 251-0465 for reservations. Join us at one of our favorite bars, Butterjoint, for a night of East End tap takeovering (yes, I said TAKEOVERING! ), featuring some beer rarities alongside great food from the always stellar Butterjoint/Legume kitchen. 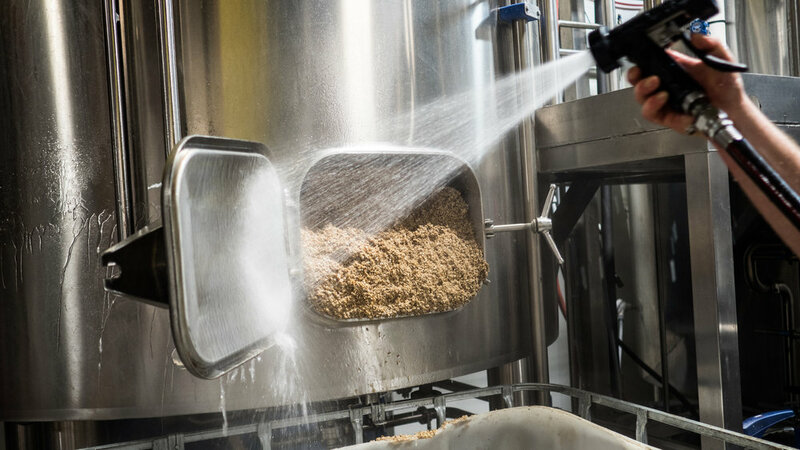 Want to learn more about how the beer is made? We've got three new options; including a low-pressure, 30 minute "Brewery 101" tour on Saturday, January 6th! TRIVIA! We've got Buzzworthy Pub Trivia here every Wednesday night at the Brewpub, starting at 7pm. Bring your pals, get a team name, and get ready to play; it's free! TAPROOM HOURS Slight change to our schedule at the Taproom in the Strip; from now on we're closing at 5pm on Sundays. Everybody got it? Good. Brewery 101 tour for beginnings and casual/interested beer fans. Brewpub, 1-1:30pm. 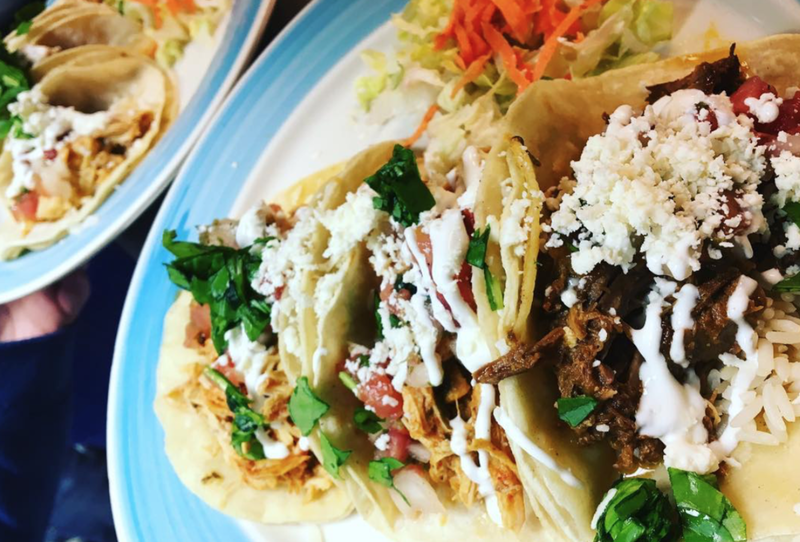 Beer Dinner with La Palapa, 6-8pm at the Brewpub. MEAT YOUR MAKER at Pork & Beans restaurant. VANDAL HUNGARIAN BEER FEAST at the Vandal in Lawrenceville. 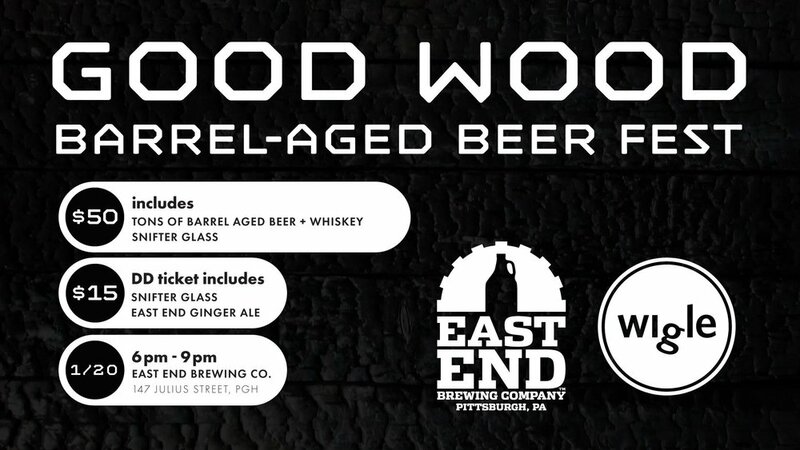 GOOD WOOD BARREL-AGED BEER FESTIVAL with Wigle Whiskey & food by Justin Severino at the Brewpub, 6-9pm. Tickets for sale here. BEER BELLY YOGA at the Brewpub, hosted by I am Yoga Squirrel Hill with live music! 10am-noon. Tickets here. Here's our hours for the next few weeks of holiday shenanigans. Plenty of time to stock up on cans, bottles, growlers & crawlers, bring the family for a pint, or just get away by yourself for a bit. There's no judgement in beer.